Of all the times of year when an extra punch of caffeine is most necessary, December is right there at the top. The holidays are exhausting, and sometimes the only way to make it through a long day of shopping is to dose yourself with some mid-afternoon espresso. 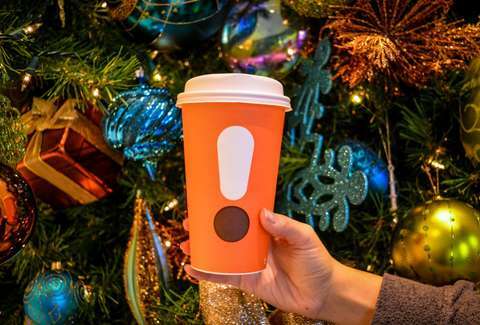 Fortunately, the caffeine-peddlers at Dunkin' know this, and they're making it cheaper to get your fix by offering $2 espresso drinks every afternoon for the entire month of December. The freshly renamed coffee and donuts chain just announced it'll be running a special happy hour deal every day at from 2pm to 6pm from now through December 30, featuring $2 cappuccinos and lattes. Specifically, the promotion applies to any medium-sized version of the aforementioned beverages, both of which sport the company's new "stronger" espresso blend. You can also get them with any of the chain's lineup of espresso drink flavors, including the seasonally appropriate Winter White Chocolate or Cinnamon Sticky Bun. Though, once you've revved up with a latte and powered through what you have to get done, don't forget to treat yourself to some $1 cocktails.